Convenience Fees will apply to these services! The City of Ste. Genevieve is dedicated to being a quality community in which to live, work, and play. In order to achieve this mission, the City will develop and deliver programs, policies, and services that enhance the lives of our citizens, employees, and visitors, while supporting our current businesses, and attracting businesses and industry to the area. Take the opportunity to visit the Official Ste. Genevieve Tourism Site where you will find place to visit, things to do, as well as where to stay, dine, and shop. Click here. Founded in 1735, Ste. 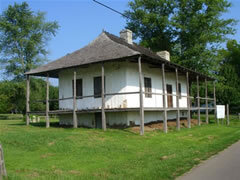 Genevieve is the oldest permanent European settlement in the State of Missouri. It was founded originally by resident French Canadians and migrants coming across the Mississippi river from southern Illinois. To our north St. Louis was founded in 1764 by Pierre Laclède and Auguste Chouteau. Ste. Genevieve's Historic District contains 29 types of architecture, with some 78% of these buildings contribute significantly to the area's historic past in our nation's history. Some of these buildings date back to the late 1700's. To give you a timeline, Missouri was admitted to the union a slave state by the Missouri Compromise on August 10, 1821. At the same time, Maine was admitted as a free state to keep the balance of slave and free equal in the Union. The land we sit on was purchased in 1803 by the United States in what is known as the "Louisiana Purchase". Some 828,000 square miles was purchased for in 2011 dollars was $233 million. People came here, primarily up and down the Mississippi River and settled here and built places to live and trade goods according to their own architectural styles. This is quite evident in our Historic District where 646 buildings contribute to the area's significance as a Historic District! Many ethnic groups are represented here including Native American tribes like the Missouria, Illinis, and Osage; African-Americans, as well as immigrants from places like Ireland, France, England, Italy, and Germany. Each bringing their own styles of architecture. As you can see, our town is quite a history lesson! Bring your family and freinds here for a weekend visit. We have plenty of things to see and do here that will make for a memorable visit. Come see us!